With the appointment of a new US President elect the world always has a slight sense of panic about the new elected administration when it comes to a different finger on the red button. Since their inception nuclear weapons have changed quite a bit in terms of their size and the scale of devastation they can unleash. While some are quite small, others are huge and their impact is mind-bogglingly devastating. As such it can be hard to really gauge the type of destruction some of the most powerful can unleash. This video by RealLifeLore (above) gives some visual, and terrifying, reference to that destruction, analyzing the various sizes of impacts of different nuclear devices, along with looking at the history of these weapons and what countries possess them. As such it doesn't make for the most calming of viewing, especially in light of knowing Donald Trump is going to have his finger on the red button soon enough. I'm sure for some of us who've watched to many action movies involving attacks on the White House by terrorists it's a scary thought. As a mark of how powerful nukes have become, the Hiroshima bomb is used in the video as a mark of measurement, with the largest ever nuclear explosion being equivalent to an incredible 3,333 Hiroshimas. 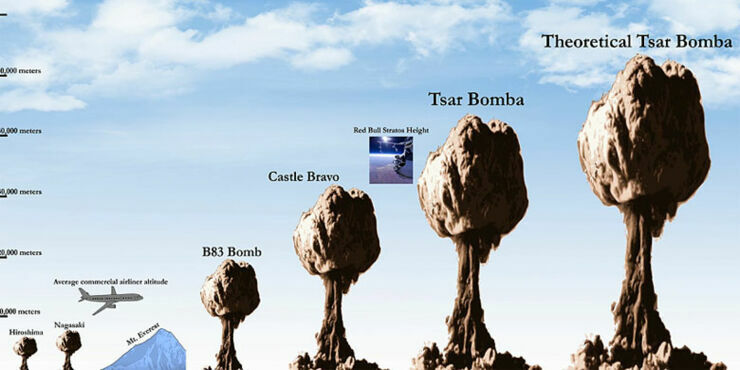 That bomb was called the Tsar Bomba and although it was dropped in an area of northern Russia it managed to shatter windows as far away as Norway and Finland. Russia did plan to make another bomb twice as powerful, but thankfully never did. Because when you look at the size of the mushroom cloud it would've theoretically produced, it absolutely dwarves Hiroshima.